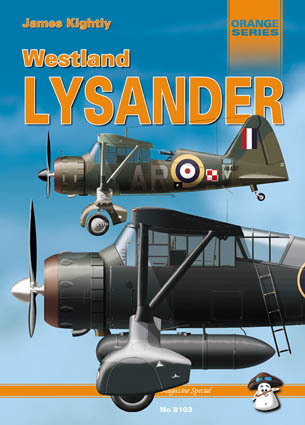 Mushroom Model Magazine continues their Orange series with a useful and detailed reference title on the Westland Lysander. At 208 pages, this book is somewhat bigger than others in the series. The author, James Kightly, takes a logical approach to the subject. The text starts with a description of the concept and prototype development, followed by RAF war service in Europe, North Africa and the Middle East, plus lesser known fronts in Madagascar and the Andaman Islands. Next, we are told about foreign production and service with such countries as Canada, France, India, Burma, Ireland, Egypt, Finland, Portugal, Turkey, the USA, Yugoslavia and Latvia. The various roles of this flexible workhorse are also covered - ASR, target towing, Special Duties, combined operations, health and naval. These historical and operational sections are covered in 87 pages, with copious captioned photographs to illustrate the text. 24 pages of technical descriptions follow, including plenty of close-up photos and line drawings of some well-known and more obscure variants. This section also offers a pilot's viewpoint from pre-flight to take-off, handling and landing. Units, codes and detailed specifications are also provided. Following several pages of colour photos of surviving Lysanders, we come upon more than 50 pages of detailed walk around photos, including access to some of the most out of the way areas imaginable (inside the rear fuselage, for example). Artur Juszczak rounds out the book with 28 colour profiles of the Lysander - some one to a page, some three, and several three-view illustrations - representing the mainstream colours and some of the most interesting special schemes in RAF and foreign service. The quality of the artwork is very good. This is the most detailed title dedicated to the Lysander that I have seen. It will be interesting to all RAF enthusiasts, but is especially helpful to modellers due to the ample detailed reference photos and line drawings, plus the inspiration of the attractive artwork.